Welcome to the information age. You are not unique. This problem of information inundation is a relatively new but almost universal threat to your livelihood. Four or five years ago, sales people were not too concerned with it. Today, dealing with information is so critical that it is an important part of almost every seminar I present. Here’s the issue. Technological advances in recent years have multiplied the amount of information that you must handle. The quantity of information landing on your lap has increased from sources all around you. Think about how much information you must keep about your customers. A few years ago, it was OK to keep everything in your head. 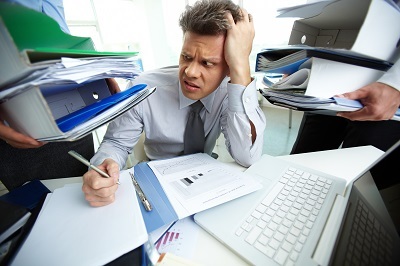 Today you need forms, documents, files and systems, both electronic and paper, to keep it all straight. Consider the technical details of the products and programs you sell. Aren’t they more complex and sophisticated than just a few years ago? And all that complexity takes the form of additional information that you must organize and master. What about the computer systems you use and the information produced by them? Most sales people I know could spend eight to twelve hours a week just reviewing computer printouts if they choose to so. Add in memos from the boss, service bulletins, price increases, government regulations, new product specifications, the details of ever more complicated applications, etc. and your job is awash in information. The sheer volume of information coming at you is like an approaching tidal wave. If you don’t create some safe haven for yourself, you’re going to be rendered ineffective by the absolute mass of information. Imagine how many precious selling hours you could waste each week if you don’t harness that tidal wave of information. Or, imagine the time robbed from your family and personal life by the time it takes to handle more and more stuff. It’s time to recognize the problem for what it is: A serious and malevolent new threat to your effectiveness. So, what do you do? How do you overcome this threat? How do you get control over the flow of information and protect your valuable selling time? One strategy is to become defensive. In other words, to develop ways to defend yourself from being overcome with useless information. The idea is to keep tempting but useless information from stealing your time. To do so, you need to understand and implement two key processes. The first is “screening.” Imagine the screen on your window. This fine mesh allows those breezes that you want to flow into the house, while it keeps out of the house those insects that you don’t want. So, it allows in that which you want, and keeps out that which you don’t want. That’s the idea behind the process of screening – allowing in that which you want, and keeping out that which you don’t want. Unfortunately, you can’t surround yourself with a physical screen. But you can implement the discipline of “screening” all the information that comes your way. To do so, you need to establish the habit of quickly assessing every piece of information that cries out for your time and to quickly decide if it is likely to be useful. Useful is the key and operative word. If your quick perusal of a piece of information leads you to believe that it may be useful, you let that piece in. If you believe it will not be useful, you keep it out. In other words, you dispose of it. Let’s imagine a scenario. You’ve come into the office and pulled a pile of stuff out of your mailbox. The first thing you see is a new price list for a product line you rarely sell. Is this useful to you? Probably not. You throw it out. Next is a service bulletin on a piece of equipment that you haven’t sold in years. Is it useful? Probably not. Out it goes. Next is a computer report comparing last year’s sales in three product lines to the sales from two years ago on those same lines. Is it useful? In the round file it goes. Finally, there’s a memo from the boss outlining the agendas, location and schedules of sales meetings for the next two months. Better hold on to that one. You continue on this way, quickly appraising every piece of information, and disposing of every piece you deem to be not useful. This whole process may have only taken a few seconds. But your disciplined “screening” process kept a lot of “useless” information from sucking away your time. The net effect was that you created more selling time for yourself by disciplining yourself to keep out that which is useless, and to allow in that which is useful. OK, so now you have a pile of stuff that, on first glance, looked like it might be useful. Now what do you do? Implement the second key process – triaging. You may be familiar with the word. It has a medical origin. In every hospital emergency room, there is someone who performs the ‘triaging’ function. They make a quick assessment of the condition of the incoming patients, and then send them to different degrees and types of treatment depending on that initial assessment. So, one person is told to wait in the waiting room for a while longer, another is sent directly to the OB department, yet another is admitted to surgery, etc. The person who does the triaging sends each patient to a location for treatment based on that initial assessment. Now that you know what your options are, you are ready to ‘triage’ the pile of information on your desk. Look at each piece, and place it in the location where you can deal with it appropriately. If you have thought about this beforehand and arranged an effective file system, this process may take you a just a few moments. At the end of that time, you have everything in its place and you can now deal with it in the time and place you choose. You sit down with the “Read and handle immediately” pile and process it. The “study this when you have time” file goes in your briefcase to be reviewed while you are waiting for appointments, or on those occasions when you are having lunch by yourself. The stuff for “account folders” and “product folders” goes home with you and is reviewed and filed in your home office all at once on Friday afternoons or Saturday mornings. By implementing these two disciplines, you’ve taken what could have been an hour or two of information-engagement and turned it into a few moments of disciplined involvement on your part. You’ve gotten back hours of selling time, and not allowed the tidal wave of information to wash you away. This process of screening and triaging can work for you with any kind of information. Apply it to your list of daily emails and email attachments. Ditto the stuff in your inbox, and the pile of envelopes and catalogues that appear every day in the mail. Do the same with your choice of Internet surfing and TV channel hopping. Unfortunately, the information-rich world in which we live has created a situation where some of the techniques and strategies that used to work for you are no longer as effective as they once were. To maintain your effectiveness in a rapidly changing world, you need to take on new skills and processes. Defending yourself from the tidal wave of information which threatens to drown you is one of them. ← Are You Hindered by Formerly Effective Sales Policies?